Cakes always prompt good news! 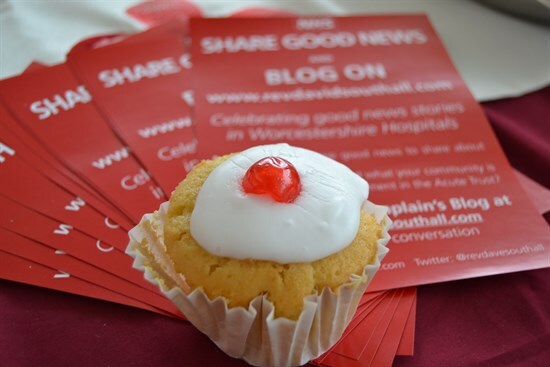 I recently ran a Blog Stand in the main entrance of Worcester hospital, with so much help from lovely staff, and met some wonderful people. Here is onl email which came, as a result of our event, from Michelle. “I promised I would drop you a line after sampling one of your delicious cakes the other day on one of my many hospital visits. I’m presently undergoing treatment for my second bout of breast cancer which involves many visits to the hospital. I must say that without exception, everyone that I have come into contact with has been absolutely amazing. It’s not the easiest news to deliver to someone but I have felt involved, informed and able to make choices about my treatment with the advice, guidance and expertise of the staff at the hospital. Miss Bright Thomas has been an amazing consultant and breast care nurses, Helen, Linda, Liz and Tracey have always been there at the end of the phone or to arrange for me to visit when uncertainty arose. Reception staff at sorrel, Terri and Lesley are also amazing people-persons and I love to have a catch up when I am there. It’s quite a social – and certainly stops me looking at my visits as anything negative, quite the contrary! It’s a shame that I can’t name everyone, but I would like to say that without exception, absolutely everyone has been chatty, friendly and helpful to me on my journey through Xray, phlebotomy, anaesthesia and surgery and more recently on the Rowan Suite in the chemo unit. Not forgetting the porters, cleaners, caterers and volunteers all of whom contribute to the wellbeing, hygiene and safety of us, the patients. I think Worcester has an amazing hospital, full of wonderful caring people who choose to go into this line of work because they really do care about other people. My experience has been (and continues to be) extremely positive and I would like to say a huge thank you through you to all of these wonderful people. May they be blessed to continue to do what each and every one of them does best. This entry was posted in Rowan Suite, Worcester Acute Trust News and tagged care, good news, make a difference, Medicine, National Health Service, Worcester Royal. Bookmark the permalink.